Need a kids spinach salad recipe that will please? Even as adults we know it’s healthy to eat these leafy green vegetables because they offer buckets of nutrition, loads of antioxidants and are low in calories and these are exactly the same reasons we want our kids to eat them too. But it’s hard to get some kids to eat a bowl of this leafy green stuff, especially raw. Of course it’s no secret that making the salad a little sweeter is one way to make it more appealing. This is the reason there are so many recipes that offer a sweeter dressing. Of course other additions such as cubes of cheese, mandarin slices and apple chunks also help make it much more tempting for them to try. There are literally thousands of recipes out there and believe me, we’ve created and tested a bunch of them, but we like this one the best as it’s easy to make and even though it is a healthy kids meal everyone in the family loves eating it. The method below may differ from many others but two things are very important to me. I need the food’s presentation to look great so people will want to dig into it and I want to get it done fast and that's why preparing it as written below works so well when making this kids spinach salad recipe. Place 4 empty serving bowls you want to use in front of you on the counter and add the baby spinach leaves almost to the top in each one. 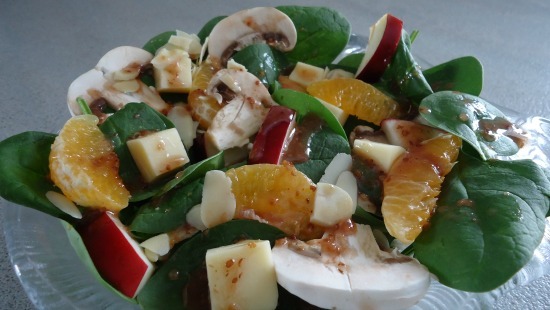 Then add one sliced mushroom, 6 mandarin pieces and 8 cubes of mozzarella cheese on top of the spinach for each of the bowls. Then divide and add the apple chunks amongst the 4 servings as well. Garnish with some slivered almonds and take the dressing (recipe below) and evenly swirl some on the top of each salad. It works out to be approximately 2 tablespoons per serving. This kids spinach salad recipe makes about 4 servings – these are smaller sized portions better suited for kids. A good rule of thumb is to use about 2 oz of spinach leaves for every adult serving and a little over 1 oz for a kid size portion. 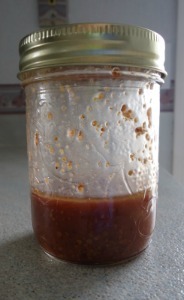 I snapped a picture of the jar I use to make this handy dressing. It’s a good idea to make double batches to have a little extra because it’s also good as a veggie dip and a handy dip for chicken strips, anything that helps them enjoy more healthy kids meals. Place all the ingredients for the dressing into a small glass jar that has a lid and shake it up real good. I love that this dressing is so easy to make. This dressing is perfect for 4 servings. Love the fact that most supermarkets offer spinach prewashed and ready to go. Whether sold in a bag or box this convenience is an amazing time saver. If you’re in a hurry, skip making the dressing and use a store bought one they usually have a couple kinds of sweeter dressings. You should have no problem purchasing a raspberry vinaigrette dressing, but in the slight chance they are out a poppy seed dressing works well too. If you don’t have rice vinegar, don’t sweat it. You can substitute it with red or white wine vinegar, regular white vinegar or balsamic. The taste will change a little but each one of these works well. The great thing about raw spinach is if you have purchased a little too much and it has started to wilt you can cook it up with a little butter and onions or add it to any kind of soup so it will never go to waste.